Stuart and I are in Rome at the moment. We're staying in an apartment, and as I step out my front door, I can literally see the Colosseum at the end of my street - that's about 20 metres away! The Colosseum is situated beside the ancient ruins of the Roman Forum, and the Appian Way - which was kind of the M1 for ancient Romans - leads up to it. 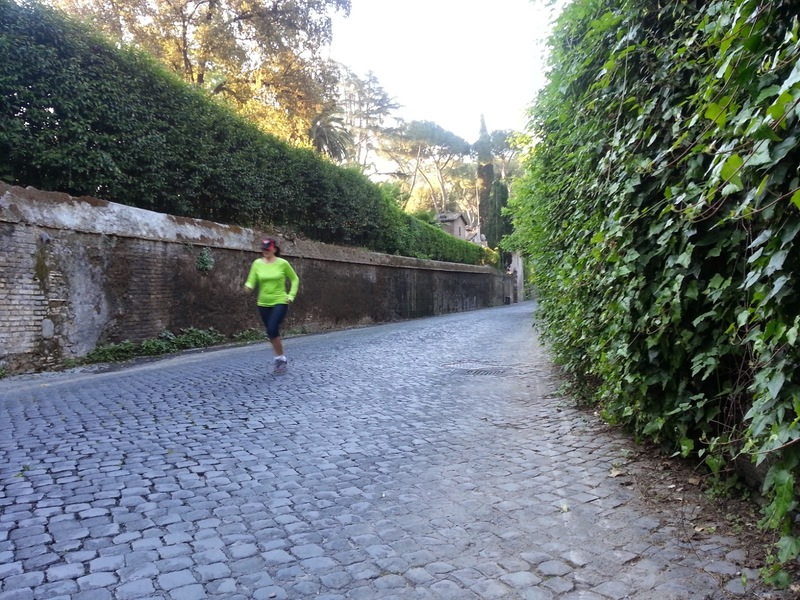 These days, some of the Appian Way has been bituminised, and is still being used as a major road leading to the CBD of Rome. Most parts of the Appian Way are not bituminised and are largely as they were 2,000 years ago. 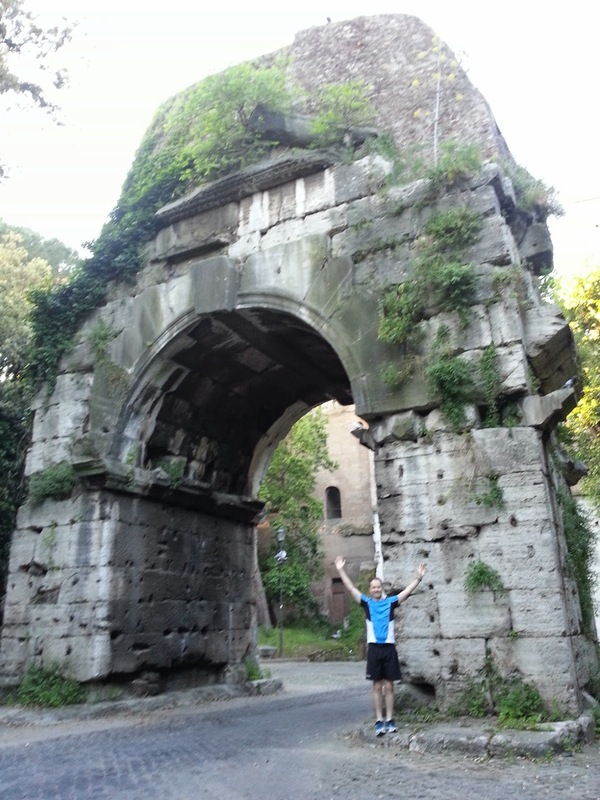 I have visited Rome many times over the years and I never tire of the ancient monuments. I'm always inspired to write about them but what could I possibly write that hasn't been written before? Now, that is the key to travel writing. I'll be the first to admit that I'm not a travel writer. To be honest, I think travel writing is an artform that needs to conjure a feel, a smell and a taste of the subject for the reader so they are intrigued enough to want to visit and experience it for themselves. I don't think I'm good at that, but I'll try to describe what I'm looking at right now. As I sit at the dining table in my apartment, I'm looking out of the ground floor window at a street littered with cigarette butts and motor scooters and motorbikes. There are buildings here that are at least 1,000 years older than colonised Australia, still being used as homes, offices and places of worship. I have shutters on the window which I have thrown open to let the morning air inside and I have decorative bars to prevent unwanted visitors from also coming inside. The road is narrow, not much wider than the driveway of your house and the footpath is cracked, pot-holed and deadly but no-one seems to care or complain. There's a cafe on nearly every street corner, each one selling the best damn coffee you'll ever taste and there are fontanelle on almost every street delivering fresh, clean mountain spring water straight from the hills around Rome. Even though their houses have running water, the locals collect the fontanelle water each morning in watering cans and buckets for drinking - it's so pure, and it tastes as good as Melbourne water. 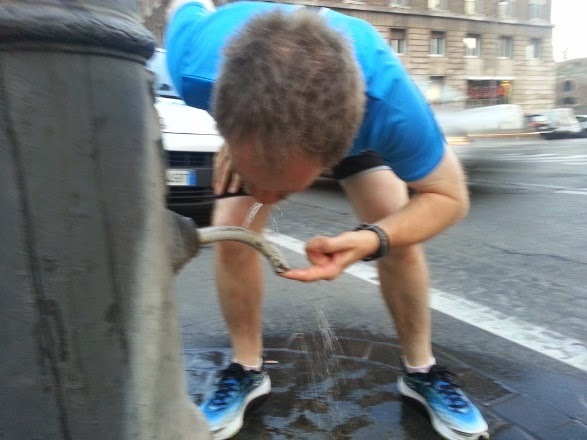 Runners don't need to carry water bottles! As I watch, a young lady pulls up on her Vespa and takes off her helmet - that's her only concession to road safety because she's wearing a short skirt and high-heeled shoes. She's the quintessential bella figura as she shakes out her hair and every male within a 20 metre radius stops what he's doing to admire her. In the distance there are church bells pealing and closer by a man calls, bongiorno, to a friend before breaking into an evil sounding smokers' cough. There is always laughter here, loud and echoing around the neighbourhood. The locals appear grumpy and rarely seem to smile but that's part of their charm. The truth is, they're always enjoying themselves; meeting friends on the street is an excuse to be loud and every meal is a celebration. What seems aggressive to us, is really only the passion with which they embrace everything. They love Australians and all know someone living in Australia, and want to tell you all about them. They won't ask you if you know their friend, they tell you that you do. 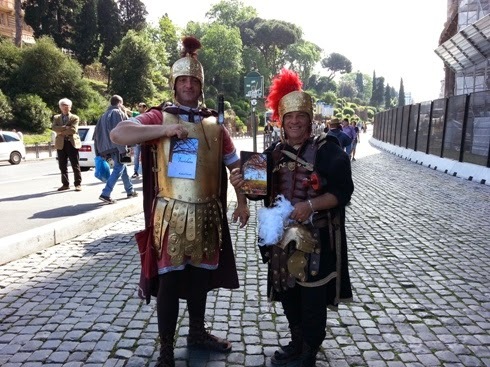 I popped over to the Colosseum the other day and asked a couple of Centurions to pose with my books. They were very happy to do so - for a fee, of course - but were chatty and flirtatious, they wanted to know where I was from and they kissed my hand as we left. Beneath my feet, not so very far down, are i Catacombi - subterranean tombs of long ago Romans that stretch for miles under the entire city. I've been down there and they are fascinating, creepy and incredible. Ok, so I can write all this and paint a picture, but am I really telling you anything you haven't heard before? Have I described anything that would make you want to visit Rome? I hope so, because this city is one of the most beautiful and aggressively passionate in the world. Just being here makes me feel alive - and I haven't even started telling you about the fruit markets! Perhaps I'll save that for next week.